We wanted to show you a little of our recent Oculus rift work. Michael "Viewmaster" Morlan sat down and played our multiplayer test map with the OR, and we shot a little footage of the occasion. One thing to note, the dual screen look is broken down to each side or for each eye. We hope you enjoy it. There are almost 4 days left to get the word out, most Kickstarters have a large upsurge in the last couple of days, and we are gonna need it. So continue helping us spread the word, make suggestions on our forums, and help us make sure we are able to build this amazing project together. Thanks, and get ready for some really cool stuff we will be showing as we get closer to both our goal and the end of the campaign. Thank you all for your continued support, we truly appreciate it. The final week of our Kickstarter campaign has arrived. Together, we've raised well over half of the funds we need. Hard to believe there are just 7 days left, but there is still plenty of time. Wingman and Rob livestreamed with Bad News Barron. We'll have even more multi-player video, the Panzer concept, and an all new sizzle reel to show next week. But make no mistake, the FINAL COUNTDOWN has begun! Tell all of your friends they have one week left to join in the fun, fund this game, and help shape it. Multiplayer videos, Livestreams and 6 Degrees of Awesome! It has been a great week for Descent Underground. You guys continue to help us spread the word and it is spreading like fire all over the world. As everyone knows today is the day for our weekly Livestream on our Youtube channel, subscribe to get access to videos before anyone else. And in case you missed it here is today's Wingman's Hangout where we discuss Six Degrees of Freedom, the economy, showed our first multi-player session and much much more. As we said, we also showed our first multiplayer session, and while it is far from ready, it is pretty awesome to share these things long before we would even show a publisher. Here is a video that shows some of the fun we had shooting each other, and yes, there is still a long way to go. As we mentioned above there have been people asking us what exactly Six Degrees of Freedom means so we put together a little video to show it, make sure you wait until the very end for a little something extra. Check our Kickstarter page very near the top to see it. 10 days and counting to finish our fundraising with a bang and bring Descent back to the gaming world! After a strong weekend, we're still bringing in backers with regularity (including Erin Roberts of Star Citizen, who entered our ranks today!). We want to thank Erin and each and every one of you who have backed us so far for your faith in us and this project! It is extremely exciting to see such a passionate group of gamers unite under the Descent banner. Today was our second installment of Design Underground, and we decided it was high time to dig deeper into the topic of just what Descent IS as a franchise, and what Descent: Underground aims to bring to that franchise. Take a look, and feel free to offer your feedback on the Descendent Studios forums. Meanwhile, we're hard at work on building a new work in progress video of our gameplay, so people who still aren't sure can get a feel for what we have in store. We've added a few shots of one of our in-progress maps for a look ahead, including the blog image of our reactor concept. Chris Roberts, Greenlit, and 5k rewards - oh my! We are moving into the last two weeks of the campaign and we are over half way there, with your help, we are going to bust right through and make some serious noise doing it! A big thanks to one of our newest backers and my mentor and friend Chris Roberts, he came on board today and tweeted about it. Also we got greenlit on Steam today - thanks to everyone's overwhelming support we got approved in under 1 week - heck yes. Steam will be one of our delivery systems but not the only one, we also plan to do it here at Descendent studios along with other sites like GOG for instance. We also hit 5k backers this weekend, and we decided to let you guys decide on exactly what reward you want, so head over to our forums and put your vote in, hurry though, the poll will end Wednesday. Tune in tomorrow for the latest episode of Design Underground, featuring our very own creative director Robert Irving. If you missed last week's episode here it is again. Subscribe to our YouTube channel to get the latest news before everyone else. And in case you missed it, that is the concept for the WASP at the top of the page, the ship that is good at pretty much every task in the game. Just wanted to drop in today and make sure that everyone was aware of the great changes to the Descent: Underground Kickstarter campaign. As the blog image shows, we've boosted the top level packages. All backers at the $250 level and above will now receive a printed, bound version of the Descent: Underground art book, rather than a digital copy. The BE A LEGEND tier will now also include a digital copy of the game's soundtrack. 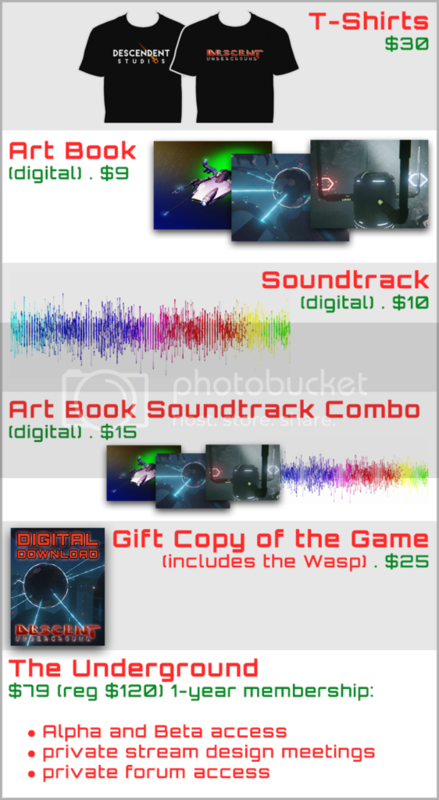 All boxed copies ($500 and above) will receive a physical copy of the soundtrack. These increases to the reward levels come hand-in-hand with the addition of new add-ons available on the Kickstarter campaign. If you are interested in adding any of these items to your pledge, simply use the Manage button next to your pledge on the Kickstarter page, add the amount to your pledge for the item(s) that you want, and let us know in the comments what you added. We're down to the last two weeks, and we're already more than halfway there, with nearly 5000 backers for the campaign! Keep helping us spread the word, and we can make this fantastic game a reality. We'll have a lot of big updates this week, so stay tuned. We are rapidly approaching our 5000th backer. Thank you for your tireless efforts in supporting Descent: Underground! Oh, did I mention that we have a treat planned for when we hit that number? I didn't did I, but we do -- more on that when it happens. One treat I can show you is the new version of the Typhoon. We have made two big changes to our Kickstarter page. First, we've revamped the page to better tell the story. Secondly, we are now offering add-ons. These include everything from T-shirts, digital art books, soundtracks, and membership in "The Underground". Head over to the KS page for more details and, since your input is important to us, let us know what you think of the new page in general. In case you missed it, Eric had an interview with Deathwish, take a look. Check back regularly for some new gameplay video, a new "Design Underground" where Rob talks about game modes, some new ship concepts, and much much more. We are getting down to our last two weeks, and we are almost halfway there - amazing amount of support you guys have shown us and we appreciate all of it as it helps us make this dream a reality. There has been quite a bit of talk about the business model of our game, so we decided to discuss it openly on today's live stream. Also, we are making great progress on our maps, here is a nice little map update - and if you look closely you might just see how the reactor cores are looking in Descent Underground. We have a couple of teams making maps at the moment so you will see a lot of the variety we are planning, as not every level will be inside an asteroid, some might be inside a space station. Today we were also featured in some new online articles. MacGamerHQ had a nice write up on our game. And, Space Game Junkie interviewed our very own Rob Irving.